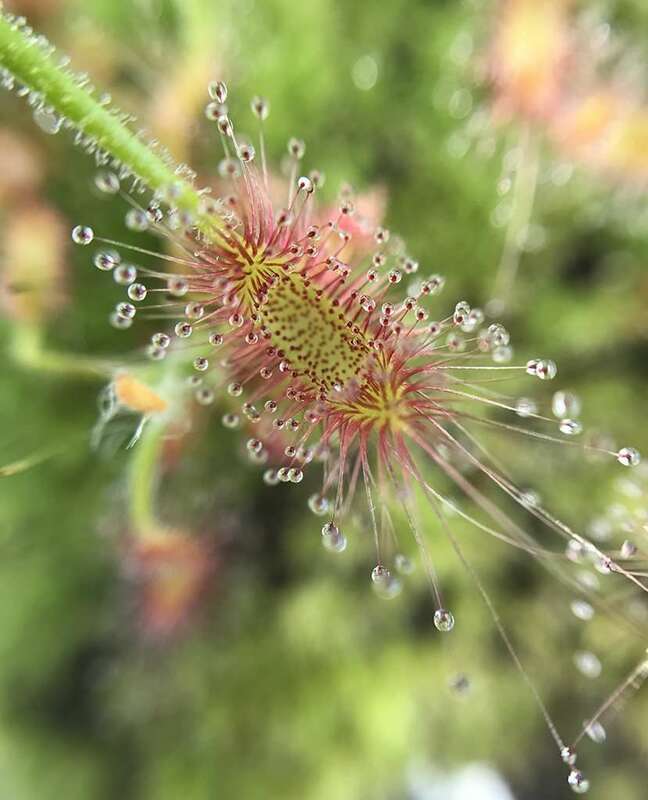 A truly international plant, the Drosera genus is the most diverse of all carnivores with nearly two hundred different Sundew species and hybrids found globally. From Cape sundews, to subtropical sundews, temperate sundews, fork-leafed sundews, tropical sundews, woolly sundews, pygmy sundews, tuberous sundews, climbing tuberous sundews, fan-leafed tuberous sundews, rosetted tuberous sundews, South African Winter-growing sundews, and the King sundew, each is truly a one-of-a-kind plant with a unique beauty. All boast delicate flowers and carnivorous habits with glittering dewdrops that give them their fascinating appearance. Your sundew will definitely turn heads and prompt friendly questions if you keep it in an observable place. Who knew that you could get rid of some of those pesky gnats where you live, and improve the feng shui of your house all in one fell swoop? 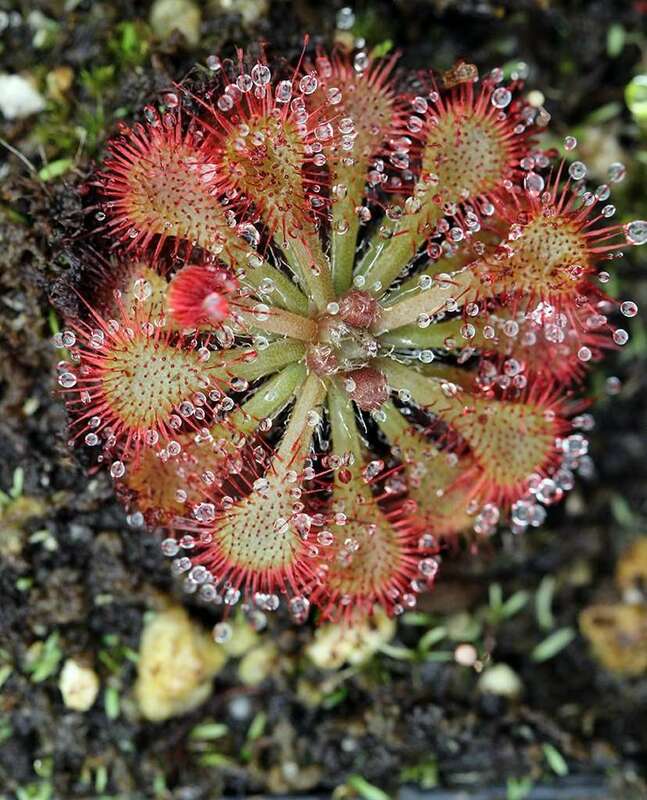 All Sundews capture prey by using glistening drops of “dew” for which the plant derives its common name. The shape, size, color, and mobility of the leaves vary across varieties yet each is densely covered with small tentacle-like hairs with singular drops of dew at their tips. 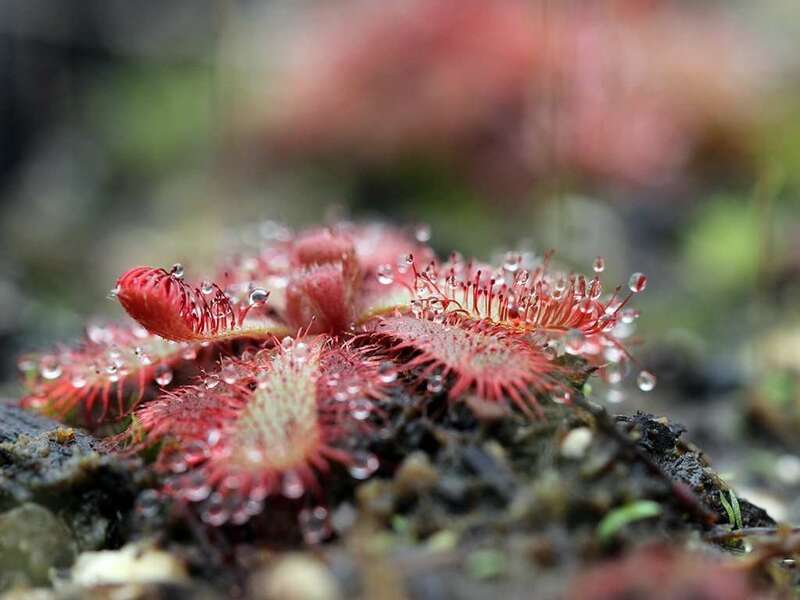 The multitude of dew drops (healthy plants can have hundreds of dew drops) make the sundew a breathtaking beauty and a sticky death trap for small insects. In reality, the drops of “dew” are actually sweet smelling and sticky drops of mucilage that the plant secretes in order to attract its prey. The bug lands on the plant thinking that it has found a sweet meal, but it becomes stuck in the goo and becomes a meal itself! Once a bug is ensnared in the dew, the hairs slowly wrap around and bind it in place. 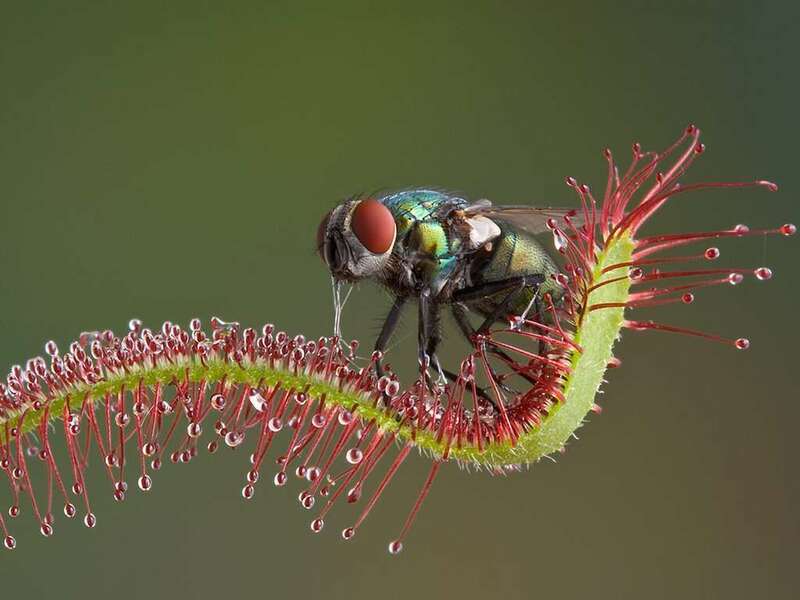 In some species, like Drosera capensis, the entire leaf blade will fold over to increase surface contact with the prey. This maximizes the amount of nutrients the plant can extract. With the bug immobilized, glands on the leaf secrete digestive enzymes and break down the insect’s soft tissues into absorbable nutrients. The plant absorbs the buggy goodness straight through the leaf, leaving behind the exoskeleton as a warning to wayward travelers. 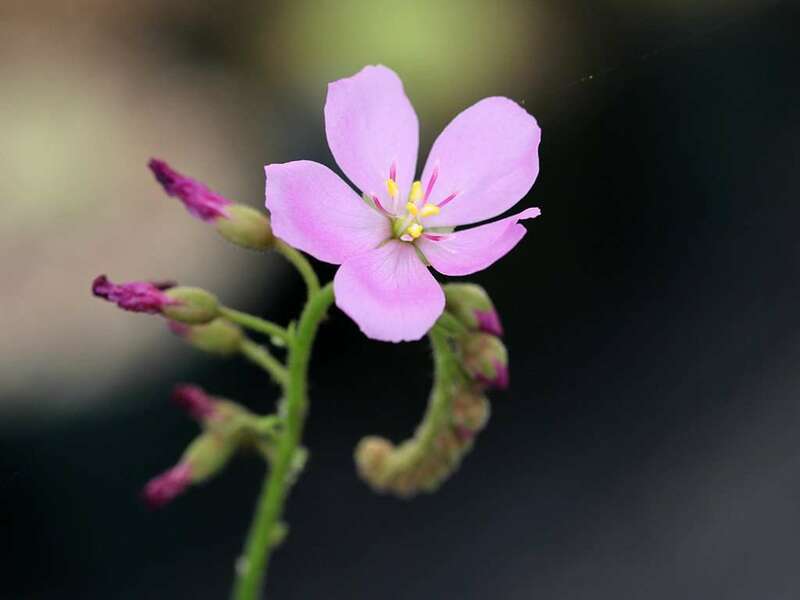 Some species of Drosera can be very hearty, proliferating to a point where they become carnivorous weeds popping up where you don’t necessarily want them. This is partially driven by branching root systems and robust seed production, but also from leaves that can, themselves, sprout entirely new plants if they touch soil. What a special plant! Cape Sundews grow year-round, but the crown, or growth point, will die back during freezes. Luckily, the plants have extremely hearty roots that can survive brief drops to fifteen degrees. When temperatures warm, the roots will sprout new crowns and resume normal growth. These Drosera are great beginner plants, and can be easily propagated from root cuttings. Frequently as easy to grow as Cape sundews, many of this species can be propagated from root cuttings, are tolerant of brief freezes into the 20’s and have thick sprout-happy roots that will regenerate growth points after a freeze kills the crown of the plant. They grow well in cool and warm greenhouses and terrariums, many enjoy bright windowsills, and can be happily cultivated outside in an almost frost-free environment. This species grows in climates with varying amounts of cold weather, but all die back to budded, hibernating growth points called hibernacula as a means to survive freezes. While all are categorized as “temperate” sundews, they’re naturally found in a wide range of locations and climates that means their cold tolerance and length of dormancy also vary. Some require 6-7 month dormancy periods in sub-zero temperatures while others are tropical, with no dormancy, and will not do well in freezing temperatures. If you’d like to grow temperate sundews, make sure you know where they hail from and their seasonal preferences to maximize your success. Another hearty Drosera, fork-leafed sundews grow from thick, dark, branching roots that are perfect for root-cutting-based propagation. They do great in a water tray system or in undrained planters with constant moisture. They get too large from most terrariums, but are superb candidates for bog gardens and do well in warm and cool greenhouses with ample sun. Not as common as you’d expect from such an exotic-looking plant, most tropical species prefer year-round temperate climates. A few are tolerant of the rare frost, but your best served staying above 50-60 degrees Fahrenheit. If you’re not living in a tropical paradise, we’d recommend growing them in a well-lit terrarium or in warm-to-hot greenhouses. 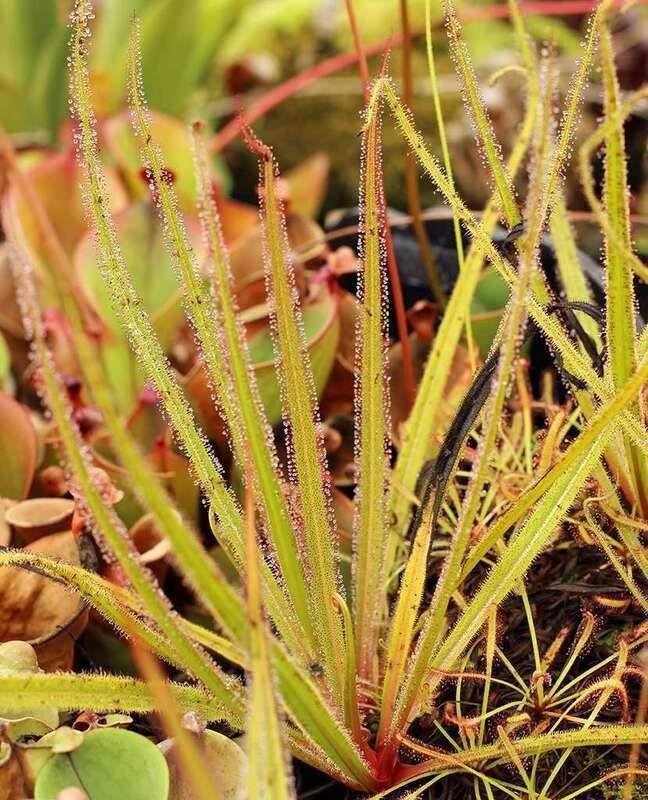 A variety of sundew with pom-pom-like traps at the end of fuzzy leaf petioles, Woolly Sundews can be found in the warm, tropical climate of Northern Australia. While they can be grown year-round in cultivation if kept wet, they are naturally accustomed to a season of six months of drought, followed by six months of rain. They seek out sandy soils that stay wet-to-waterlogged during the wet season. Drought brings on die-back to the fuzzy stems until rain returns.Grow in bright, warm (60-90 degrees Fahrenheit) terrariums or greenhouses in 2-parts washed sand to 1-part peat using the tray watering method. If you took a shrink-ray to a Drosera, you’d end up with the Pygmy Sundew. Often smaller than a USD penny, these plants frequently clump into small colonies that can be overlooked for moss if you don’t have a magnifying glass. Growing in Western Australia, they are adapted to warm-temperate to subtropical and Mediterranean-like climates with hot, dry summers and cool winters ranging from 30-60 degrees Fahrenheit. 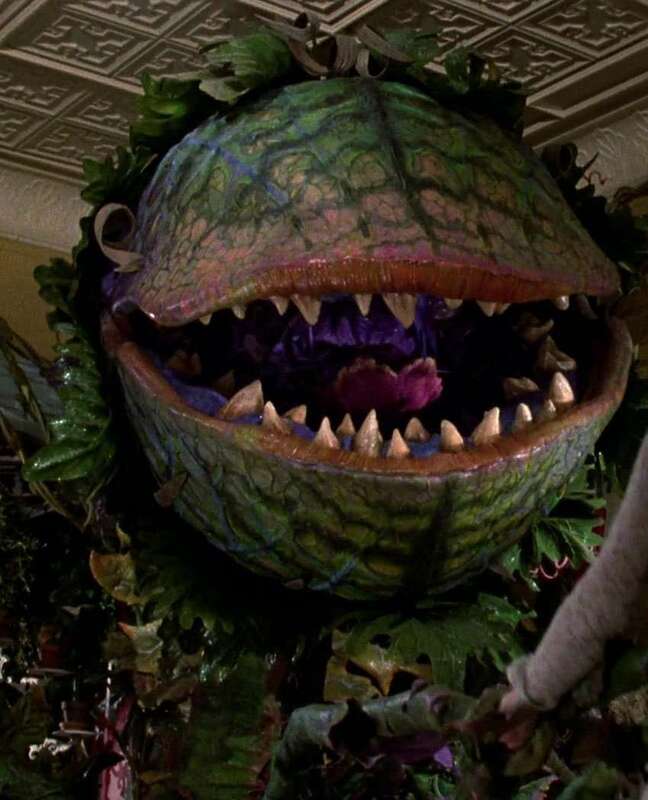 Their soil is mostly sand (grow in 2-parts washed sand to 1-part peat) and dries out during the summer months causing the plants to go dormant.Not to worry – during the wetter winter months, these plant sprout back to life and asexually produce pinhead-sized gemmae (brood bodies) that cluster around the center of the plant. Each gemma is attached to a tightly-coiled hair that, when struck by a raindrop, launches the gemma (up to several feet!) away from the parent plant. Landing in soil, these gemmae root up quickly and sprout brand new pygmy sundews. These child pygmies are clones (genetically identical) of the parent plant, and are the reason you quickly get beautiful clumps of pygmy sundews. Who needs seeds, right? Well, they actually produce seed, also… So, suffice it to say, you can quickly propagate a small carnivorous army of pygmy sundews in cultivation.They’ll grow happily in cool and warm greenhouses, terrariums, outdoors in pots and bog gardens in warm, sunny conditions, and will begrudgingly tolerate light frosts. Use the water tray method and, if grown in terrariums, reduce the photoperiod (length of light throughout a given day) during autumn to promote gemmae production. – You do want a miniaturized carnivorous army to do your bidding, right? Growing alongside pygmy sundews in Western Australia, tuberous sundews share similar dry summer, wet winter conditions. Where they differ from pygmies is in their dry weather coping mechanism. Rather than dying back to small dormant crowns to minimize water loss, they shift all energy underground and hibernate as pea-to-walnut-sized tubers. These brightly-colored bags of insect-derived energy have a small “eye” (imagine an eye on a potato) that sprouts a stolon/runner during autumn along which a thick root system develops.From this robust root system sprouts growth points and traps that catch insects to feed energy back into the tuber. If more energy is captured than one tuber can store, a stolon will grow a new tuber adjacent to the original. You’ll get multiple plants, this way.Grow in 2-parts washed sand to 1-part peat within drained plastic containers using the water tray method. They do well in bright warm and cool greenhouses between the mid-forties and low-seventies. Consider repotting every three-to-four years and separating the new tubers that have been produced. Similar to “normal” tuberous sundews, the only real difference here is the climbing nature of the main stem off which the traps grow. These stems can grow up to three feet tall, and branch to the point of creating a small carnivorous “tree.” While normally self-supporting, the overall weight of these plants can result in them leaning on surrounding plants. Again, similar to normal tuberous sundews, climbing Tuberous Sundews vary in above-ground growth. They have flexible main stems that stop at nothing to grow several feet – climbing over obstacles and using their carnivorous leaves as small, sticky hands to grasp onto adjacent structures for support. This can produce a fun vine-like effect that, if wound around other carnivorous plants, makes every square inch of the combined plants an insect death trap. Truly bug nightmare material. Fan-leafed tuberous sundews share growing conditions with other tuberous sundews, but have unique above-ground growth. They produce ground-level basal rosettes and one-or-more stems that can reach 6 inches in height. The ground traps catch crawling insects, while those suspended off of the stems snag flying prey. South African sundews have thick root systems that support those varieties of the species that have 3 month dormancy periods. Some will actually grow year round in wet conditions and do great in a soil of half peat to half sand. For dormancy, let the soil dry out for 2 months, then lightly dampen for one month until growth restarts at which point you’ll want to switch over to the water tray method. 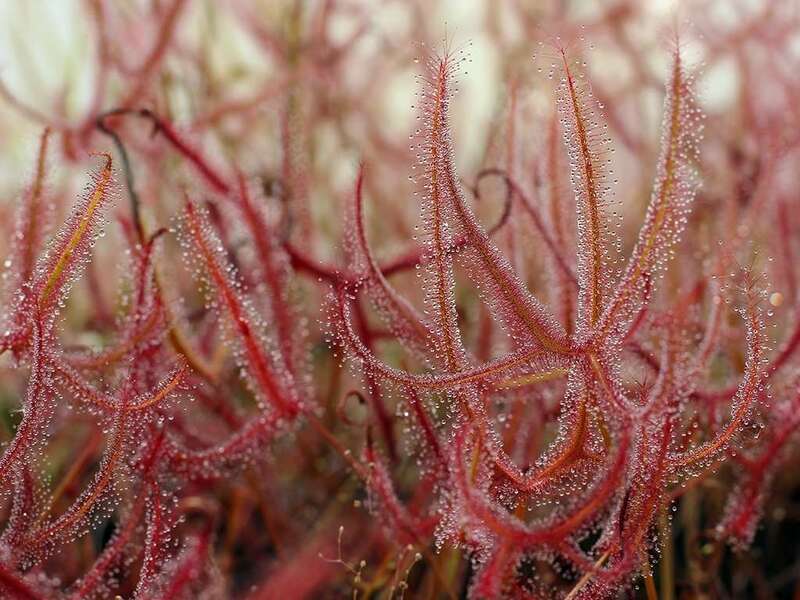 There is only one King Sundew – Drosera regia (you didn’t think a king would share his throne, did you?). An unfortunately rare plant in the wild, there are only a few colonies known in South Africa. They are impressive plants that form stems from which grow long, narrow leaves up to two feet long. These leaves produce thick “dew,” and snag just about any insect foolish enough to land on them.They grow well in large pots of 20% perlite to 80% part long-fibered sphagnum using the water tray method. Keep them outdoors in cool, frostless climates, or indoors in warm and cool greenhouses. Coastal California windowsills are a great spot. Do note that the plants will reduce in size, or occasionally die back during winter months, but will regrow from the robust root system during warmer weather.On the topic of roots – Drosera regia don’t take kindly to being disturbed, so once established in large pots, leave them be for multiple years. Any roots that start growing out of the bottom of the pot can be cut off for root cutting propagation.The King’s thick roots frequently sprout offshoot plants of their own free will. Hmm… would these be considered Prince Sundews? 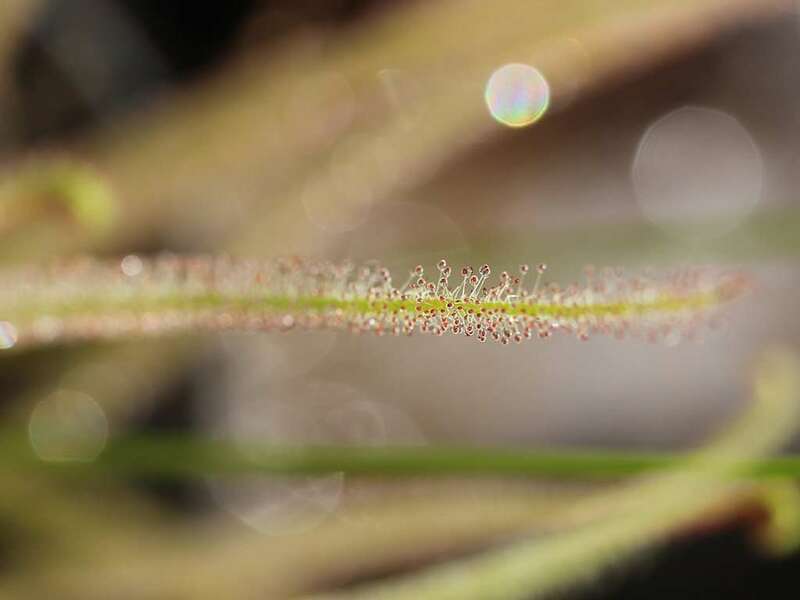 Sundew flowers vary dramatically in seasonal timing, shape, size, quantity, and the amount of seed produced, but most are beautiful shades of white, pink, or red and all share common reproductive structures. 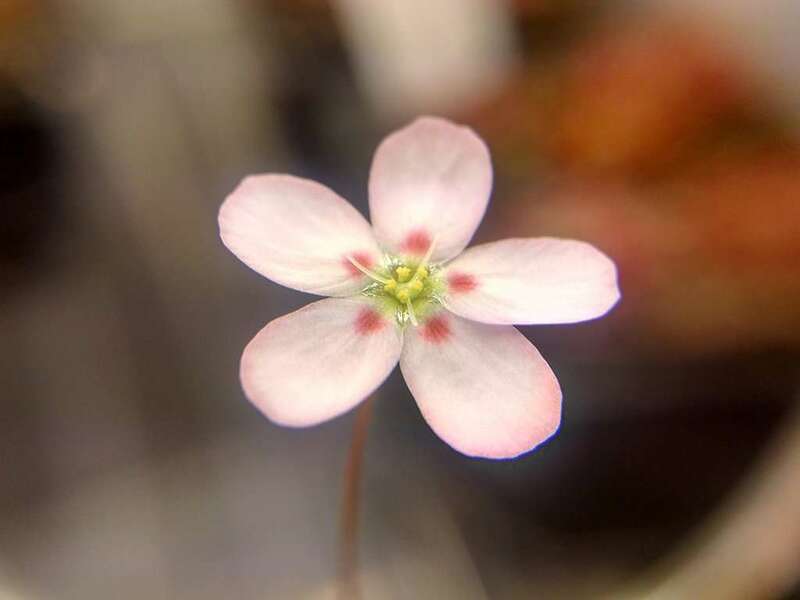 Timing for Drosera flowering varies by species and is dependent on what part of the world they originate from and have adapted to. 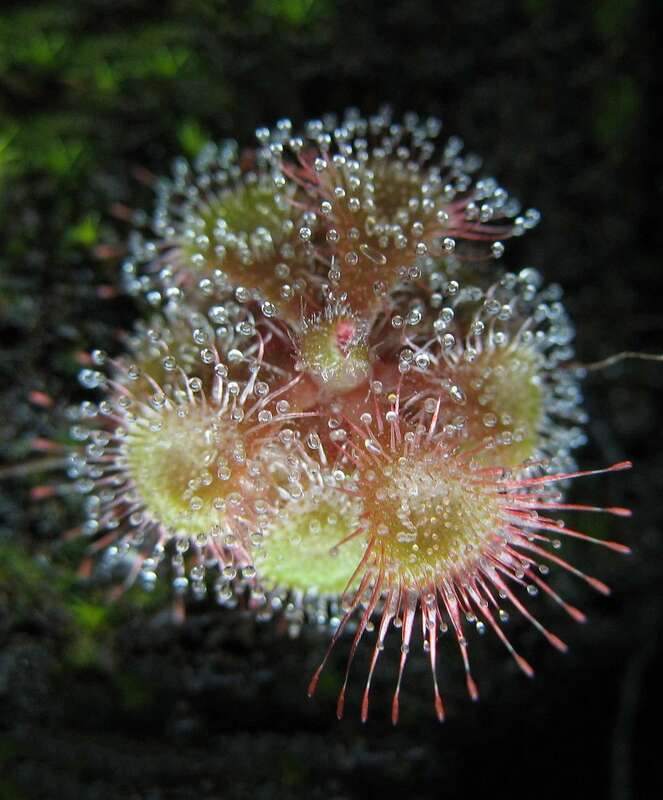 For instance, many will grow alongside other seasonal carnivores flowering around springtime, while others like tuberous sundews will flower between October and December only after they’re adjusted to the northern hemisphere. Many Sundews will self-pollinate when the flower closes, but you’ll see better results if you manually assist the process. Pollen from anthers needs to be transferred to the stigmas. We suggest using something like a toothpick for this. Once pollinated, the pedals will frequently close or fall off and the ovary will begin to swell as seed production begins. The seed pod will take several weeks to mature before viable seed can be collected. 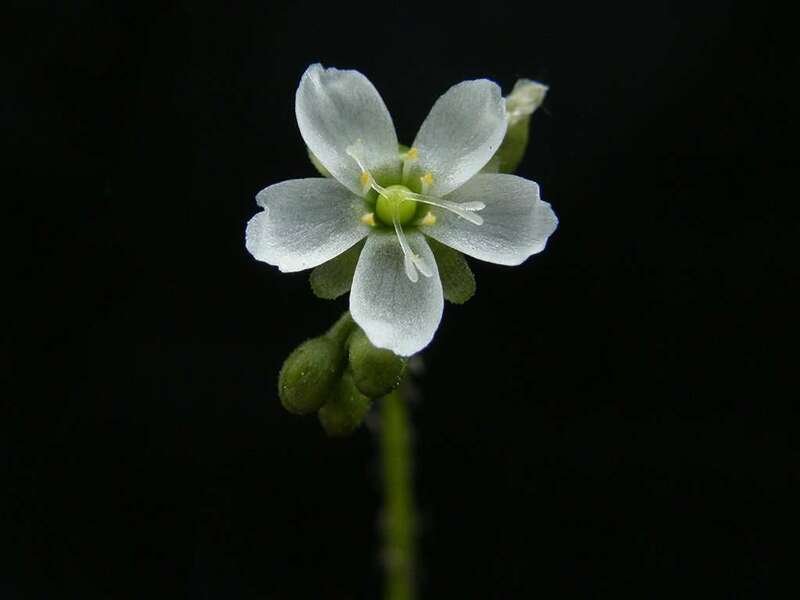 Even with the large array of reproductive methods employed by Drosera, seeds produced by flowers are often the most prolific means of propagation. 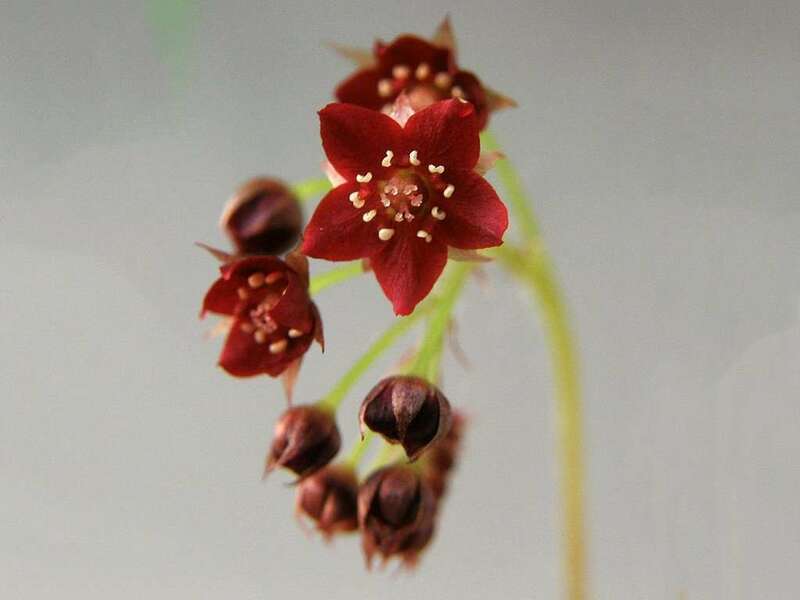 You have plants like Drosera capensis that will flower and set seed until your entire carnivorous plant collection is infested. 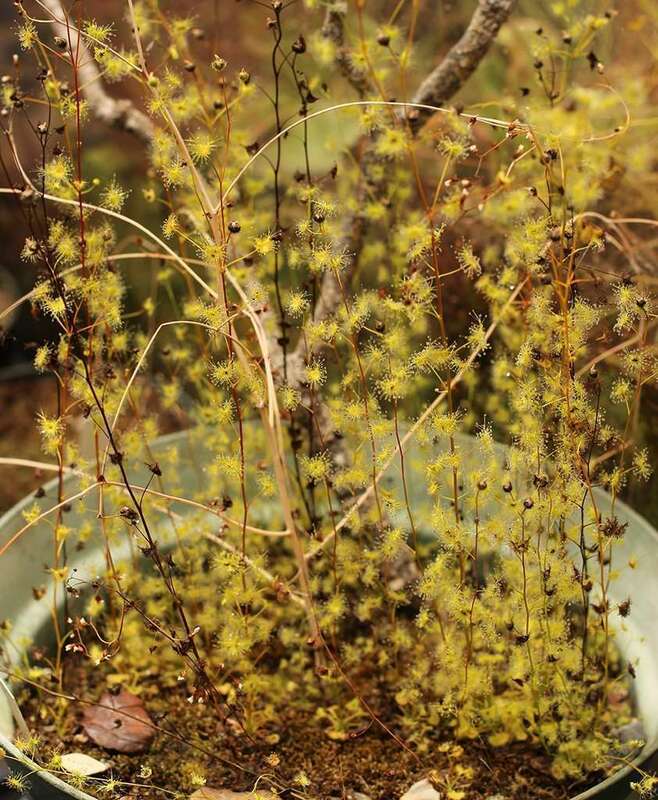 There are some exceptions, however – varieties like tuberous sundews will rarely produce seed in cultivation, and pygmy sundews can reproduce more prolifically from gemmae than seed.Store seeds that won’t immediately be propagated in air-tight jewelers bags or small paper envelopes and refrigerate them. Different Drosera seeds can look very similar, so remember to label your seed packages with the name of the parent plant so that they’re easy to identify when it comes time to germinate. European naturalists have a long and thorough fascination with Sundews, dating all the way back to Henry Lyte’s botanist book “New Herbal,” published in 1578. 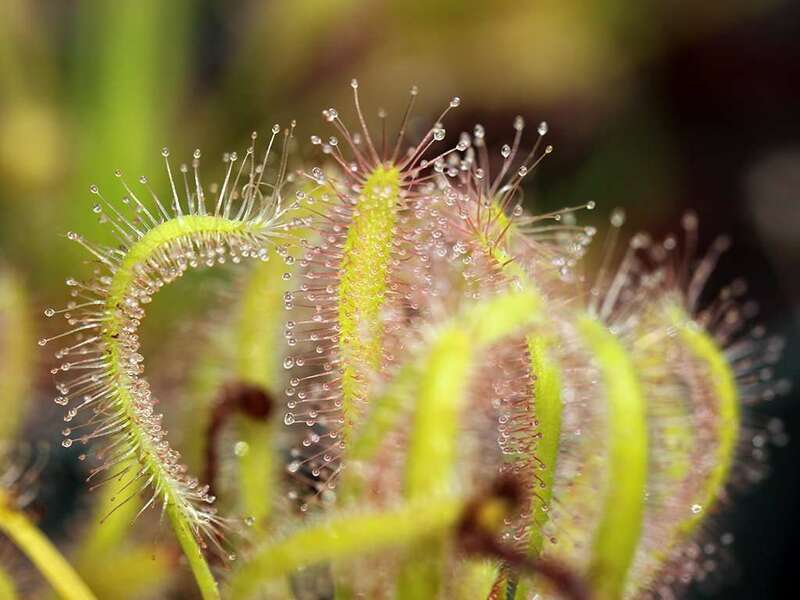 He coined the plant’s name when musing over how dew production seemed to increase in hot, sunny weather rather than evaporating; “the Dewe of the Sonne, or Sonnedew.” In Greek, Drosera means “dewy” (note, also the dewy carnivorous species Drosophyllum). Erasmus Darwin, Charles Dawrin’s grandfather, hypothesized in 1791 that the dew was a means of protection from predators. How wrong he was. Later that year, William Bartram concluded quite the opposite – that the dew was a means of attracting and purposefully capturing insects. He did no yet understand why. Additional observations from German botanist Dr. W. A. Roth concluded that the tentacles did, in fact, move to increase surface area relative to an insect’s body. 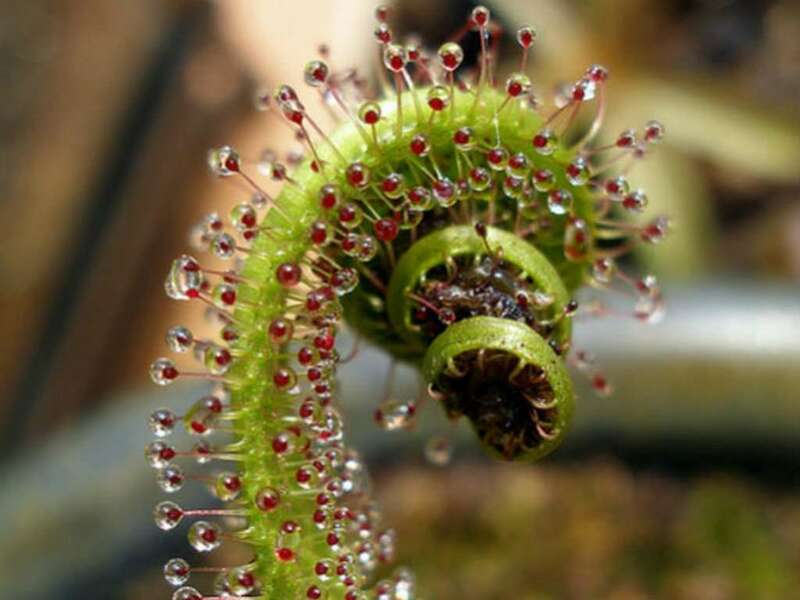 It took Charles Darwin himself to conclude the carnivorous nature of Drosera in his 1875 book Insectivorous Plants wherein he primarily studied Drosera rotundifolia. Writing his botanist friend, Asa Gray, Darwin mentioned caring more about sundews than the origin of all species of life on earth. – Woah. He described the fascinating insectivores as being more sensitive to touch and taste than the animals species he had studied, and mused that they were really animals in disguise (sounds like the start to a Transformers movie). The shorter list would include locations around the world where sundews aren’t found. 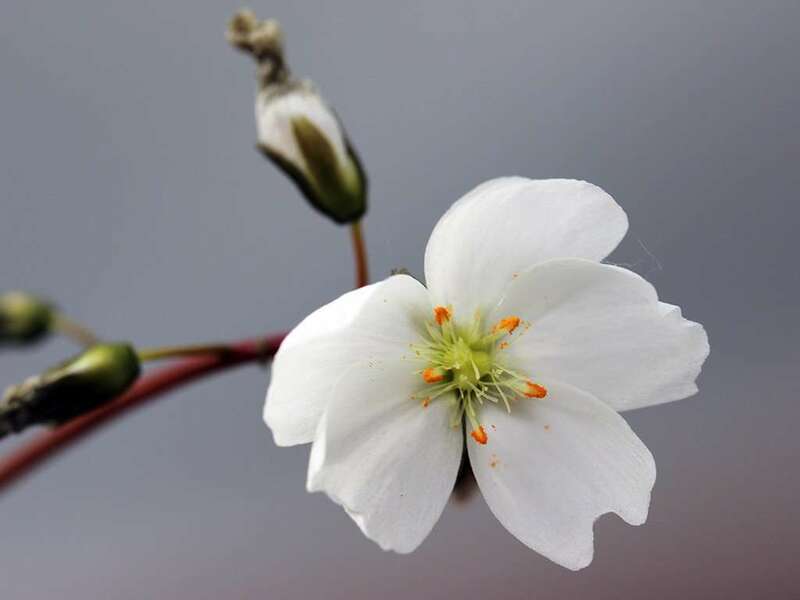 You will discover Drosera on almost every continent, including places in Siberia and Alaska that you’d prefer to avoid as a warm-blooded mammal. Of course, you also find sundews in the tropical wonderlands of Queensland and Brazil. Then we have the bogs of North America and Europe, and southern tips of South American and New Zealand. Click and drag around the map below for a preview of locations. Sundews enjoy full-to-part sun. Brighter conditions will promote brighter coloration in some species, genotype-permitting. I’ve grown many species with great success in direct, sunny Southern California light. Completely avoid fertilizing Drosera adelae, D. schizandra, and D. prolifera. Remember, these plants grow naturally in nutrient poor soils – a major reason why they evolved traps to catch insects as their source of nutrients. Fertilizing can burn roots and kill the plant, but advanced growers may foliar feed (applying only to the leaves of the plant) monthly with a diluted (1/4 strength) epiphytic or acid fertilizer. Maxsea is a good option. This is risky for a beginner and not recommended. As long as you keep your plants fed with bugs, they will be happy. Transplant during, but towards the end of, dormancy. Many sundews will be fine in one pot for many years. 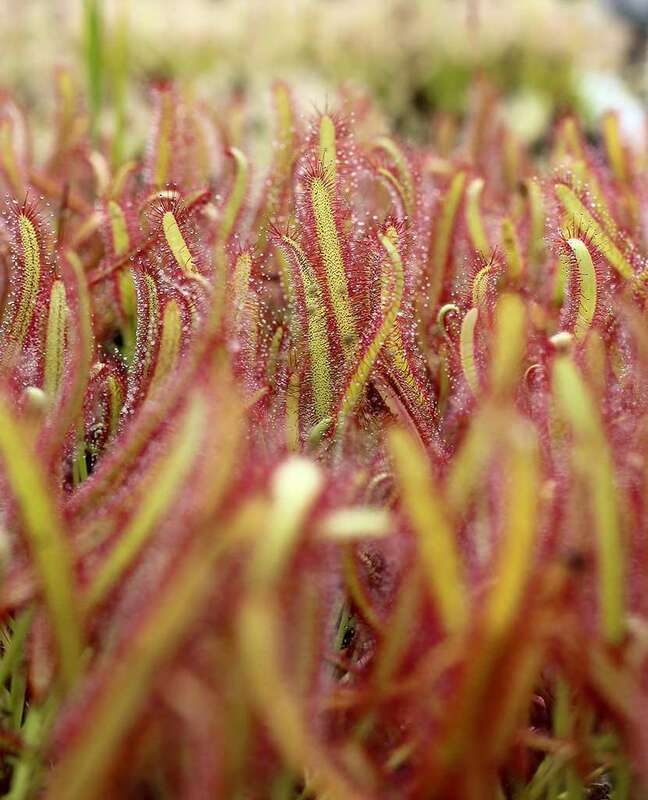 Sundews can produce offshoots and develop into clumping plants. The effect is beautiful – a shimmering sea of foliage. You can choose to separate these clumps and repot them towards the tail-end of their dormancy period. Do make sure that each crown of leaves has its own root system before dividing. Most Drosera are great candidates for leaf cuttings (except Drosera burmanni and D. regia… darn). Cuttings will result in larger plants faster than most seed-grown plants.To take leaf cuttings, first sterilize a razor blade or sharp shears (bonsai shears work great) using isopropyl alcohol. Use these to cut loose one or more sundew leaves close to the plant’s main stem. We find the best method for encouraging root and foliage growth from these cut leaves is to simply float them sticky-side-up on purified water in a closed plastic or glass container. Place the container in a lit area and swap in fresh water if algae begins to grow. After a few weeks, you’ll notice bumps on the surface of the leaves which will turn into growing points. Roots will sprout from the bottom of the leaves. After they have sprouted, transfer them to a new home in a pot with soil. Keep the soil moist, and the roots will take hold with the growth point developing into a full plant. Similar to leaf cuttings, Drosera root cuttings will result in larger plants, faster – often fully mature plants in one growing season. 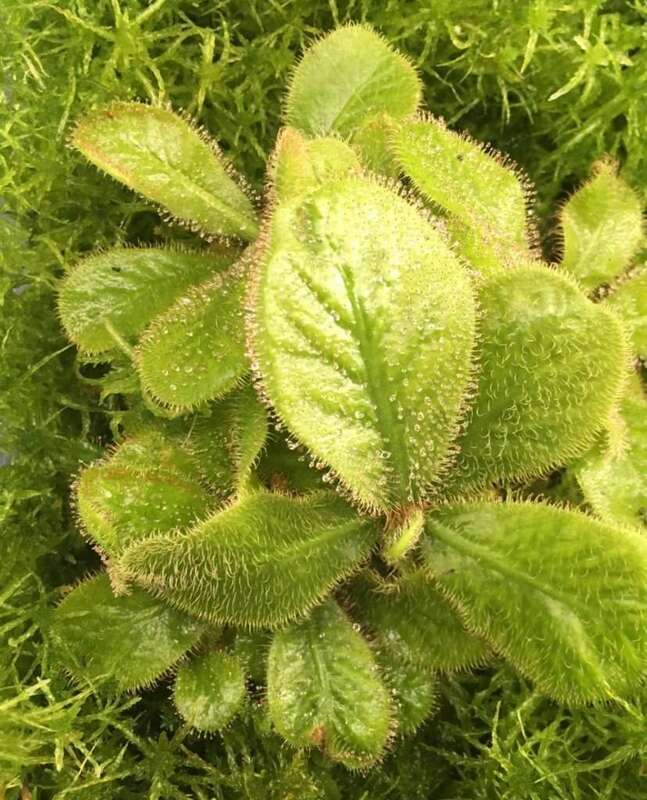 This technique works best with plants like forked sundews, rosetted subtropicals, D. regia, and cape sundews, that have robust, thick root systems.To take root cuttings, remove the sundew from soil and simply cut off 1.5″-3″ of healthy roots. The best time to do this is during a normal repotting/transplantation towards the end of a dormancy period (if the plant has one). Lay the cut roots horizontally on soil and cover with another 1/2 inch of soil. Keep the cuttings covered with a humidity dome, in bright light, wait several weeks, and viola! 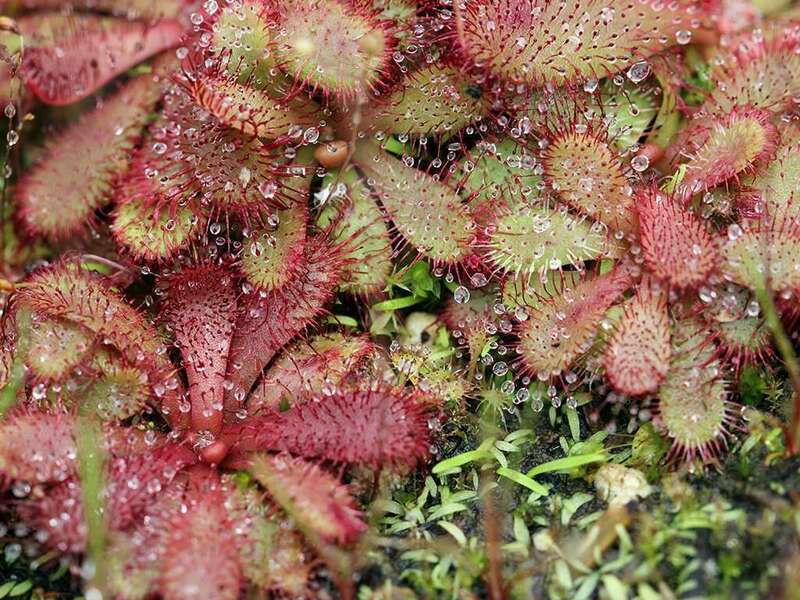 You’ll have wee-sundews bursting through the surface of your soil. After a few leaves have formed, remove the humidity dome and place in a sunny location. Sundews do great in tissue culture via sterilized seed and cuttings. As efficient as sundews are at catching insects, aphids are a pest that can harm them. 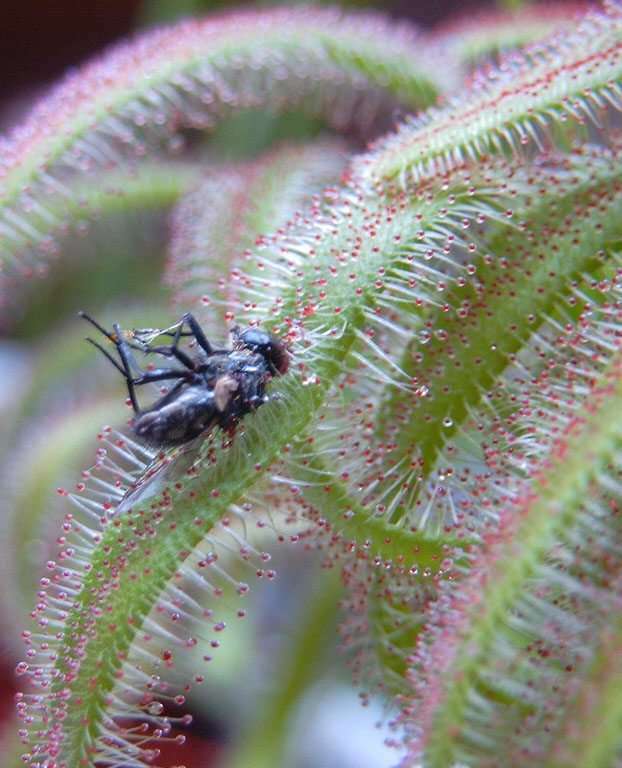 Infestations are best treated early with carnivorous-plant-safe insecticides like Ortho . Fungus can also attack during moist, low-light winter conditions and can be treated with fungicide. Physan works well against most fungi that attack carnivorous plants. 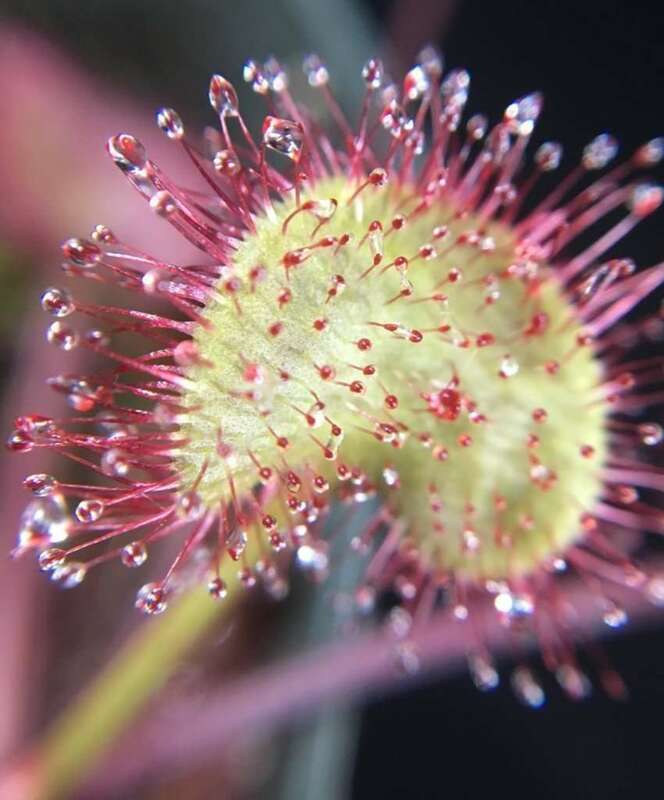 Avoid soap-based insecticides on Drosera. Because sundews grow in varied climates around the world, you’ll need to adjust climate controls based on the species’ origins. Conditions span the spectrum – Mediterranean, tropical, sub-tropical, warm-temperate, temperate, and cold-temperate. If your outdoor climate mimics the native habitat of your sundew, you’re set. The sweet-spot to grow the widest variety of Drosera is in Mediterranean, subtropical, and warm-temperate climates. 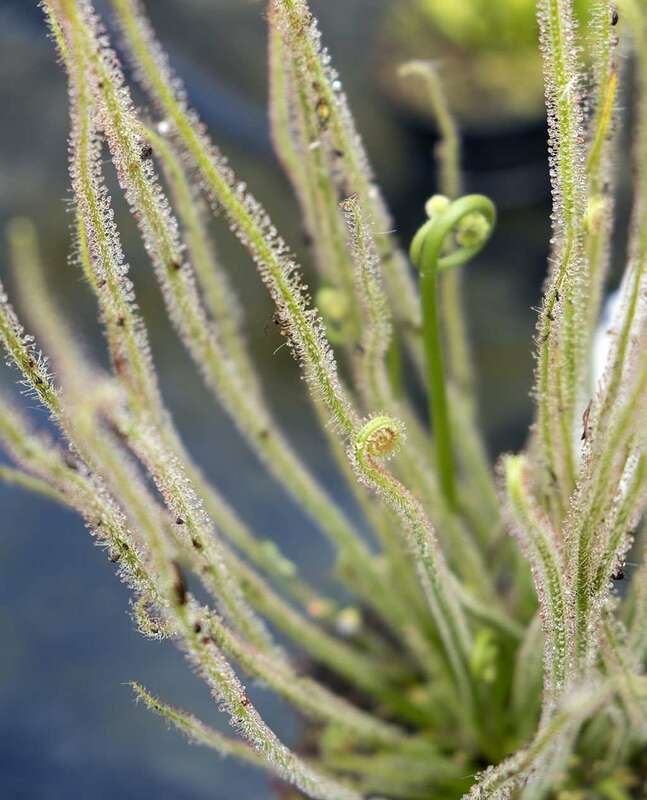 Cool and warm houses will meet most sundew needs, but consider the origins of your plant and if your greenhouse recreates preferred climate conditions. Most are great candidates for terrariums and enjoy bright florescent or LED lighting . Take into consideration the matured size of your sundew, and if a terrarium is enough space. 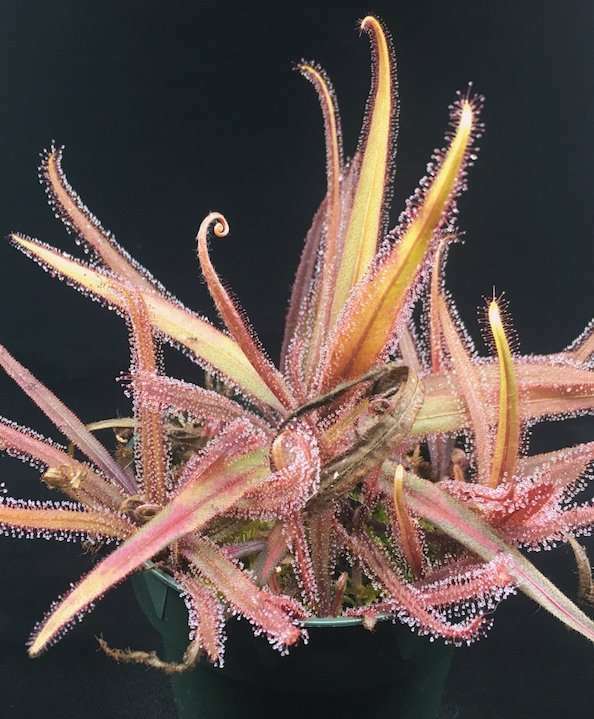 Subtropical species and cape sundews will handsomely adorn sunny windowsills. 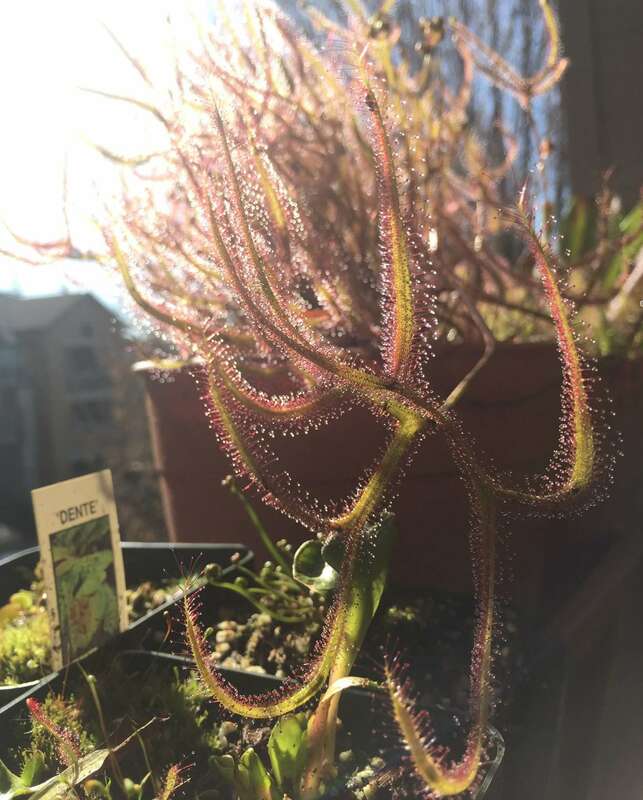 In more humid windowsills monstrous plants like Drosera multifida and D. regia will thrive. You can grow many sundews alongside Venus flytraps (Dionaea) and North American pitcher plants (Sarracenia) in bog gardens. It’s a 1-2-3 combo of carnivorous cousins!